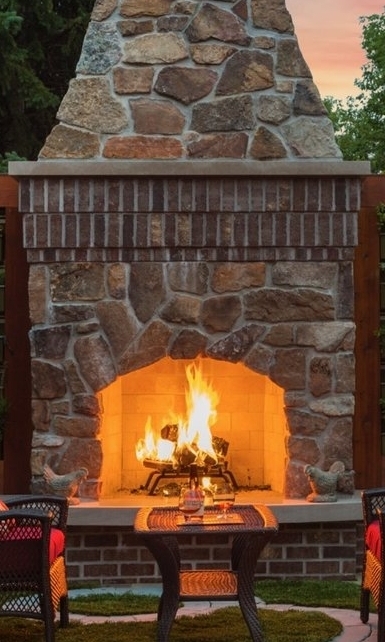 Are you daydreaming about having a fire feature in your outdoor living space? You’re not alone! Over 50% of Americans have some sort of fire feature at their home, and the obsession doesn’t end there. From Jack London short stories to pop hit songs, humans are captivated by the topic. Fire features provide great function for warmth and can also be used as a beautiful aesthetic addition to design. Often homeowners ask me, “What is better gas or wood?”. Well its a tricky question because I believe both have their place, and it is not as much a question of better as it is appropriate. Everyone is different and unique and what works best for some is not optimal for others. Here is a comprehensive guide as to the pros and cons of Natural Gas Vs. Wood burning fire places. As a kid I idolized wood fires, so i’m personally privy to the concept of natural combustion. I hold dear to my heart those summer nights as I learned the process of building and maintaining a campfire. The structure, sound, feel and smell were all so intriguing to my young mind. The journey of growth and decay a bundle takes as it burns bright and transforms into embers really spoke to me. This journey acts as a perfect visual centerpiece for in depth and philosophical quandaries of this life. When the stresses of life became too much I more often than not was able to find serenity unwinding beside the fire. I am extremely appreciative of those memories and therefor even as natural gas fire systems advance I will always be somewhat biased towards the experience that comes with wood burning fire. In addition to the natural fire journey being experiential, there is no comparison to the natural flames and sounds produced by wood fire. Check out Whimsical Paradise for natural system. As much as I love wood burning systems there is something amazing to be said about how far natural gas burners have come, and the advanced systems we have today. About 5 years ago you could not get the same warmth and size in a gas burner, it just wasn’t there. Lately due to their growing popularity, gas burners have advanced with the territory. New machining processes in the burner construction allow bigger and more visible flames then ever. You can choose from a large variety of shapes and also textures you would like your flame to be. Want more flicker? Done. In addition to burner construction improving, the latest systems have smart phone integration that allow you to start your fire remotely as well as alter its size and run time. Not only do these features make natural gas systems appealing they are also very low maintenance, and ready to go any time of the day with no work involved. If all that wasn’t enough there are still the added benefits of ascetics that come with natural gas. There are thousands of stones and glass that make for great decoration. This fire resistant glass would sit on top of the burner appearing to be the source of flame themselves. Then when the fire is turned off? Looks awesome as well. (see Winding Waters). If you’re not into the glass / stone look there are some remarkably accurate porcelain pieces that look just like real wood (see COV Restaurant). Natural gas also burns cleanly without smoke giving your eyes, hair and clothes a break. No more triple shampoo before bed to avoid smelling like an ashtray. As you can tell, there are a good number of great advantages to natural gas. Although Natural Gas vs Wood is a large debate, hopefully this guide helped you narrow down your decision. Often homeowners find themselves impartial between the two, resulting in two different fireplaces, one tailored to convenience and one for natural combustion. If you have any questions one of our award winning designers would love to come out and answer all your questions about your outdoor living space!